The summer term is the most exciting time of year for our athletes since it is the culmination of a winters worth of hard training. 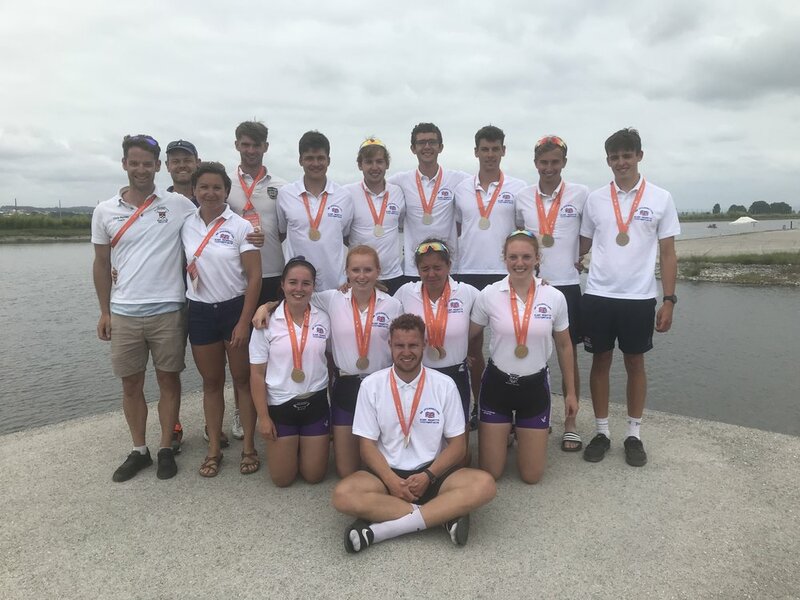 This summer was one of our most successful to date, we won twelve medals at BUCS Regatta, qualified four mens quads for the Prince of Wales Cup at Henley Royal Regatta and topped the overall medal table at the European University Games! BUCS Regatta: Gold in MIntLw1x, MInt2x, MC2x, WInt2x, MInt4x. Silver in MCLw1x, MCLw2x, WC2x, MC4x. Bronze in WInt4x, WC4x, MInt4x. Marlow Regatta: Win in Tier 2 M4x. Third in Champ M4x. Fourth in Tier 2 Mx. European Universities Games: Gold in M2x, W4x. Silver in W2x, M4x, LM1x. Bronze in LM2x. The European Universities Games is a biannual multi-sport event organised by the European University Sports Association (EUSA) and this year was held in Coimbra, Portugal. We sent a total of twelve athletes racing in six boats to the regatta portion of this event after they qualified through BUCS regatta. This was our most successful EUSA regatta to date with every single crew winning a medal totalling two golds, three silvers and one bronze. These results put us top of both the GB Universities and European Universities medal tables! Reading University also placed fourth on the overall medal table including all sports despite only qualifying athletes in rowing. A huge thank you goes out to everyone who donated to our crowdfunding page to help our students with the cost of the event, we raised over £1000 and the support is massively appreciated by all. At Henley Royal Regatta we had four boats racing in the Prince of Wales Challenge Cup, a result unmatched by any other club this year. This was a record result for us and shows the great strength and depth of our men’s squad this year. After a tough draw our C, D, and A crews were all knocked out on the Thursday. Our A crew however did perform particularly well, pushing eventual winners of the event, A.A.S.R Skoll, Netherlands throughout the race. Our B boat raced well to win their first round but were later knocked out by RTHC Bayer Leverkusen and TVK Essen by a length. Some great results overall from our men’s squad. Another great performance came from current student Mathilda Hodgkins-Byrne winning the Princess Grace Challenge Cup, racing in a crew from the GB senior squad. We also had several wins from alumni, Adam Neill raced for Leander and won the Stewards Challenge Cup while Emily Ashford and Caragh McMurtry both racing for Leander won the Town Challenge Cup. The summer term has shown the strength and depth in the men’s squad, highlighted by three student boat qualifying for Henley Royal Regatta along with a boat of alumni from recent years. Such success was also mirrored in EUSA with four medals from four mens boats. It has been a pleasure to captain the men’s squad the past year and I believe next year with Rory as captain RUBC will step on again and continue to dominate university sculling. This season has been a great one for the RUBC women’s squad. We pushed off the success in the autumn and winter term and had a great weekend at BUCS regatta picking up a gold, a silver and two bronze medals. These results meant we qualified a double and quad for the European Universities Games taking place later in the season. The next focus for the squad was Henley Women’s Regatta. Unfortunately none of the crews progressed to the semifinals, which was a disappointment however Henley Royal Qualifiers was only a week later, so our minds quickly switched to focus on this. With there only being one quad category at HRR we face very tough competition and were just off the pace with the A boat coming in as second non-qualifiers and the B boat not far behind. The last event for the girls squad was EUSA. Four athletes represented the squad out in Portugal, with myself and Chloe Knight in the double while Fran Bratt and Anna Smart joined us in the quad. We had great races really topping off the season and came second in the double behind a strong German crew. Later we took to the water again in the quad and after a last minute order switch we managed to row through in the last 200m to take gold! A truly great end to the season. Without the support of our coaches, none of this would be possible, so on behalf of the women’s squad thank you very much to Will, Charlie, Chris and Roddy for all of their help and support. I would also like to send our best wishes to Anna, Fran, Bea, Molly, Sarah and Amber who graduated this year, and thank them for everything they brought to the squad.